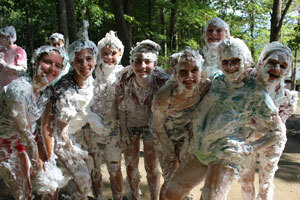 Here at Camp Crestridge for Girls we have five age groups, which we call villages. Each village has things that are unique to that age group and they also have someone called a Village Director, who plans and oversees all of their activities. Listed below are a few fun facts about each village. The Chippewa honor band is green and stands for growth. Their rank is that of an Explorer and their symbol is a coonskin cap. Their village verse is Luke 2:52 and their fruit of the Spirit is Joy. These girls are typically 7–9 years old, finishing 1st - 3rd grade. There are up to 60 Chippewa campers per session. The Chickasaw honor band is red and stands for courage. Their rank is that of a Champion and their symbol is a tomahawk. Their village verse is Psalm 27:14 and their fruit of the Spirit is Goodness. These girls are typically 10 years old, finishing 4th grade. 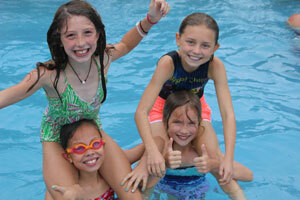 There are up to 50 Chickasaw campers per session. The Creek honor band is teal and stands for steadfastness. Their rank is that of a Cultivator and their symbol is an arrowhead. Their village verse is 1 Corinthians 15:58 and their fruit of the Spirit is Faithfulness. These girls are typically 11 years old, finishing 5th grade. 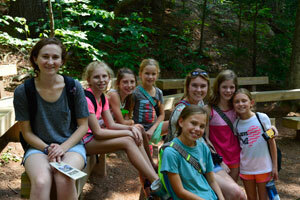 There are up to 60 Creek campers per session. The Cheyenne honor band is yellow and stands for honor. Their rank is that of a Defender and their symbol is a shield. Their village verse is Proverbs 21:21 and their fruit of the Spirit is Kindness. These girls are typically 12 years old, finishing 6th grade. 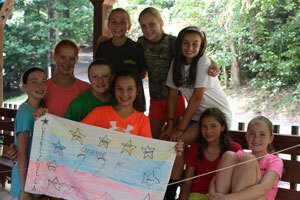 There are up to 60 Cheyenne campers per session. The Catawba honor band is maroon and stands for hope. Their rank is that of a Pathfinder and their symbol is a feather. Their village verse is Isaiah 40:30-31 and their fruit of the Spirit is Patience. These girls are typically 13 years old, finishing 7th grade. 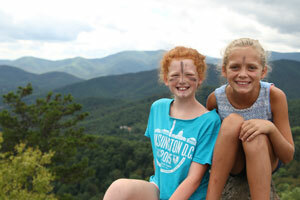 There are up to 60 Catawba campers per session. The Choctaw honor band is brown and stands for perseverance. Their rank is that of a Seeker and their symbols are shepherd’s crooks. Their village verse is Habakkuk 3:19 and their fruit of the Spirit is Gentleness. These girls are typically 14 years old, finishing 8th grade. 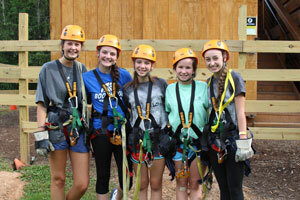 There are up to 60 Choctaw campers per session. The Cherokee honor band is blue and stands for truth. Their rank is that of an Achiever and their symbol is an arrow. Their village verse is John 8:32 and their fruit of the Spirit is Self-Control. These girls are typically 15-17 years old, finishing 9th – 11th grade. There are up to 80 Cherokee campers per session.